Luxury Cruises: For over 20 years The Yachts of Seabourn has been offering the ultimate in luxury accommodations on the high seas. The Yachts of Seabourn provides ultra-luxury cruises on small, yacht-like ships to the most desirable destinations in the world. Their fleet of ships offers guests to enjoy better, more personalized service than on any other cruise line, elegantly decorated and spacious suite-style cabins, fine dining on board ship that is as exquisite as any traditional land-locked restaurant. This luxurious experience can be enjoyed while sailing to almost any destination you can think of in the world. Other options including combining trips to explore more on The Yachts of Seabourn Grand Voyages option, seeing the world on a World Cruise and even making a Transatlantic voyage. Each yacht in The Yachts of Seabourn fleet is as intimate as a personal yacht, but comes with extra indulgences, like a poolside neck massage. Each yacht is small, with the largest and newest yacht accommodating 450 guests and the others less than half of that. 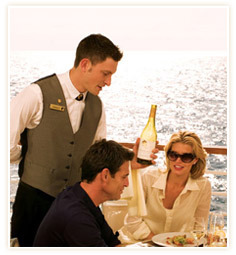 On board ship, guests can indulge in the open-bar policy and enjoy menus by celebrity chef Charlie Palmer. As part of their emphasis on over-indulging passengers, Seabourn offers Seabourn Signature Delights®, extra special touches to ensure that your experience proves to be the best vacation you've ever had. The Yachts of Seabourn offer special luxury touches and privileges, including the Vintage Seabourn privilege. Vintage Seabourn allows guests to choose a pre-purchased selection of wines at special prices, all from the ships cellars. The wines are carefully selected by sommeliers and may be enjoyed onboard in either the Silver Connoisseur Collection or the Gold Connoisseur Collection. While onboard, guests can also indulge themselves at The Spa at SeabournSM and the onboard fitness center. The spa uses custom therapies and treatments and the fitness center offers not only personal trainers, but fitness classes as well. If all this luxury and indulgence seems like too much, fear not because Seabourn offers a variety of specials, clubs, programs and other incentives to help make your luxury dream vacation come true.